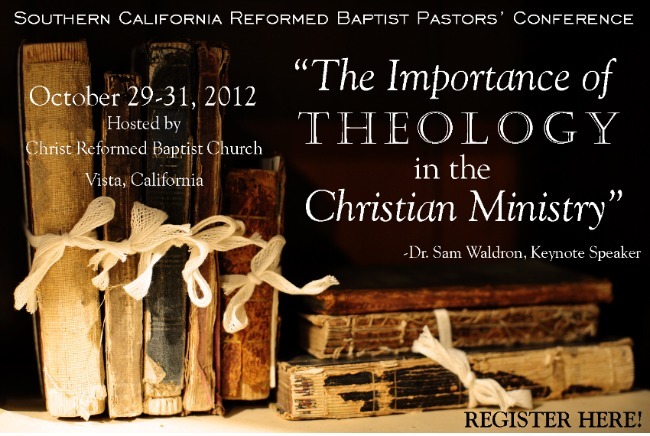 The Southern California Reformed Baptist Pastors’ Conference will be held from October 29-31, 2012 at Christ Reformed Baptist Church in Vista, CA. The primary purpose of the SCRBPC is for the edification of those in the Christian ministry. The conference will function within the theological framework of the Second London Baptist Confession of Faith. Eight lectures will be delivered by at least two men, followed by ample discussion time. Pastors, Students, Interns, and Aspirants are cordially invited to attend. Dr. Sam Waldron, Dr. Richard Barcellos and Dr. James Renihan will be speaking.